Last Saturday was International Record Store Day, and to coincide with the celebrations we proudly announced that on May 24th we will be screening Jeanie Finlay’s Sound It Out at Armley Mills’ Palace Picturehouse. 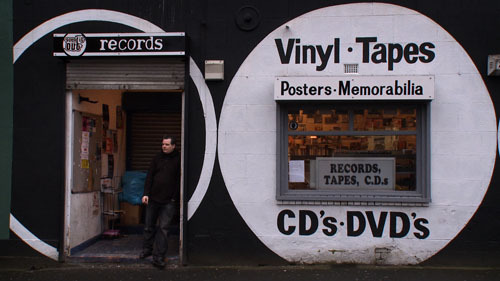 The film chronicles the day-to-day running of Sound It Out, the last remaining independent record store in Teesside, and showcases the stories of the shop’s shop’s staff and the most dedicated patrons, who recant tales of their love affair with music. Watch the trailer below. This charming documentary is the embodiment of Minicine’s ethos and was a hit at last year’s Leeds International Film Festival. Click here to see what our director Mike had to say about it when he saw it at last year’s British Federation of Film Societies’ annual conference. If you’re a member, you can buy your ticket right now by clicking here. Remember, as a member you can also reserve an additional +1 for a non-member. As tickets are only open to Minicine members at the minute, the best way to make sure you’re there is to check out what membership gets you here, and sign up. If you want to catch the latest information, be sure to Follow us on Twitter, ‘Like’ the Facebook page or join the Facebook event for this screening here and e-mail minicine@live.co.uk with the subject MAILING LIST to be added to our e-mail distribution list. This screening will be at our usual home at the lovely Palace Picturehouse in Armley Mills. For more info on the venue and how to get there, see the website. It would be a lot of fun to go and see the film with a friend. However, it is quite disappointing is that tickets are only available to Minicine members. It would have been nice if anyone was eligible to attend the filming of SOUND IT. Please accept our apologies that the wording wasn’t quite as it should be in this post. We are always open to the general public, but we open tickets to members a week in advance. Thus it is one of the major benefits of joining up as a member, along with the reduced rate and many other perks. We should have made it clearer in the post above that this is the way we always function and that tickets will be open to the general public, if there are any left, on the 30th April. Thank you for bringing this up, we would never want to be a members exclusive society, but we do like to give our members the kinds of advantages that make them feel part of something and so they hopefully feel appreciated for their loyal support. Hello, do you now know if there are any tickets left for non-members? And if so how would you buy the tickets? I can’t see any sort of information like that on here. Hi Rosie, there were some tickets for non-members left, but sorry, they sold out very quickly I’m afraid. We tried to direct everyone from the post above to the Facebook Page and the Twitter feed where we announced when tickets opened. They didn’t last that long, as we expected. If you ever do need to check find any of that information though, our tabs at the left of the screen are often helpful. ‘In the Cinema Now’ will have the most up to day information on what we are screening next and the ‘Buy Tickets’ tab will take you to the online box office where you can find information on all tickets available. If you aren’t already, would you like to be added to our mailing list? Simply e-mail minicine@live.co.uk with the subject MAILING LIST and you will receive all the information that we send out in future. ah, aha! I couldn’t see those links at the side of the screen at all – when the window is not full screen, for whatever reason on my browser (IE8), you can’t actually scroll down to see those links, so couldn’t find any of the buying tickets type information. That’s fine, I will look forward to coming another time!